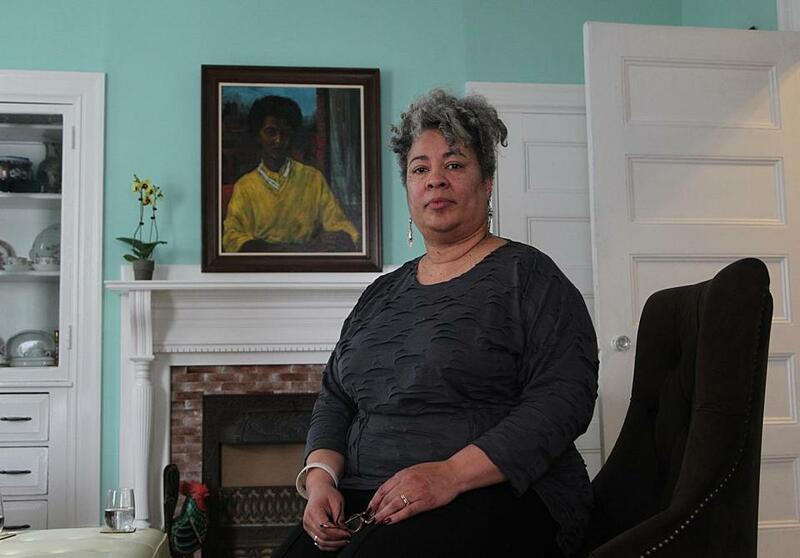 Joi Gresham, director and literary trustee of the Lorraine Hansberry Literary Properties Trust, in front of the portrait of Hansberry that hangs over Gresham’s Cambridge mantel. When Lorraine Hansberry’s “A Raisin in the Sun” opened in New York on March 11, 1959, it was the first play by a black woman to be produced on Broadway, and its director, Lloyd Richards, was the first black director to work there as well. Hansberry was also the first black playwright (and the youngest) to win the New York Drama Critics Circle Award. Since then, the drama about a black family’s dream to move into a white neighborhood in pre-civil-rights-era Chicago has been translated into 30 languages and has been continually produced in church basements, community halls, school auditoriums, and professional theaters. And now the play is sparking a reenergized debate about race relations in theaters here and nationwide. “Raisin” begins performances Friday at the Huntington Theatre Company. 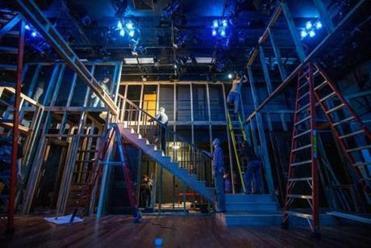 Meanwhile, “Clybourne Park,” Bruce Norris’s Pulitzer Prize-winning 2010 play examining the same Chicago neighborhood 50 years later, is receiving its Boston premiere in a SpeakEasy Stage Company production that runs through March 30 at the Boston Center for the Arts. A book published last year, “Reimagining ‘A Raisin in the Sun,’ ’’ includes four plays that jump off from where “Raisin” ends, and another spinoff play, “Beneatha’s Place,” makes its world premiere in May at Center Stage in Baltimore. Why, at a time when some pundits have declared that the reelection of the nation’s first black president signified the dawn of a post-racial America, is there so much interest in “Raisin” and the issues it raises? The play was inspired by Hansberry’s own experience with racism and housing discrimination. Her father was stonewalled when he tried to buy a house in a white neighborhood much like the one in the play. He sued and won a partial victory in the US Supreme Court. But the play is undeniably specific to a time and place — and to a black family. In the play, the Youngers, led by the matriarch Lena, live in a cramped, tumbledown apartment where privacy is nonexistent. The men and women in this world are forced by circumstances to do menial work: They scrub toilets, wash other people’s laundry, drive well-to-do white folks around. When Tommy was a young artist working at fringe theaters in the Boston area, she was invited to audition for Kenny Leon’s 1995 production of “Raisin” at the Huntington. She didn’t get the part, but it spurred her desire to pursue a graduate degree in theater. “That was a huge moment in my life,’’ she says. “Clybourne Park,” which won the 2012 Tony Award for best play and the 2011 Olivier Award for best new play, enjoyed critical and commercial success in both New York and London, and it is being produced at regional theaters nationwide this season. In fact, SpeakEasy and the Huntington have done some joint publicity for their independent productions; in February, Tommy and M. Bevin O’Gara, the director of “Clybourne Park” at SpeakEasy, participated in a panel discussion about both plays at the Strand Theatre. But during an interview, Tommy chooses her words carefully when asked about “Clybourne Park.” “All I can say is, I’m glad that it has created a new interest in ‘Raisin in the Sun,’ which is getting produced everywhere,’’ she says. 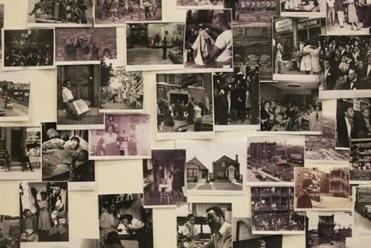 A research wall of photographs from the era of “A Raisin in the Sun” hangs in the Huntington Theatre Company’s rehearsal space, where actors can study the images. 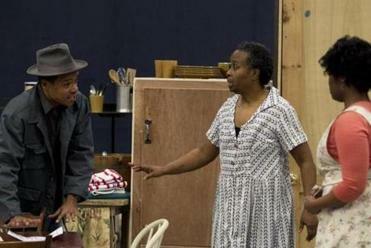 At Center Stage in Baltimore, “Clybourne Park” will play in repertory with “Beneatha’s Place” this spring. That play, by Center Stage artistic director Kwame Kwei-Armah, was written in direct response to “Clybourne Park.” “I saw the play in Britain, and I thought it captures the zeitgeist and creates a great conversation,’’ Kwei-Armah says. “I read that Bruce was inspired by Karl Lindner, the only white man in the play. I was attracted to Beneatha.” His play focuses on Lena’s Afrocentric daughter and charts her journey to Nigeria and later to the halls of academe in California. “She has a determination to fill the minds of the world and the university system with a global understanding of white supremacy and the history of Africa,’’ Kwei-Armah says. 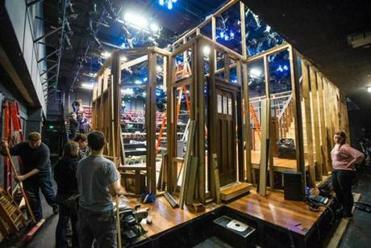 “Clybourne Park” takes place in the house the Younger family buys in “A Raisin in the Sun.” SpeakEasy Stage Company’s set at the Boston Center for the Arts was a work in progress last week. Norris says he hasn’t had any contact with the Hansberry estate and didn’t even know of its existence. Gresham, who has been Hansberry’s literary executor since her mother died in 2005, controls the rights to “Raisin”; she says she is in negotiations with Denzel Washington for a 2014 Broadway revival. She has seen “Clybourne Park,’’ but will not comment on it publicly. “There are some legalities involved, and I’ve been advised by my lawyers not to make a statement about the play,” she says. Gresham says she did once refuse to grant the rights to “Raisin” to an Australian theater, because it was not planning to employ black actors. When that company asked permission to use “alternative casting,” she suggested it look at the Aboriginal question. She never heard back. Likewise, Norris put a stop to a production of “Clybourne Park” in Berlin last year, because a white actor was going to perform in blackface. “It was a perversion of my play, and I can make that decision. I’m inconveniently alive,” he says. Playwright Bruce Norris. 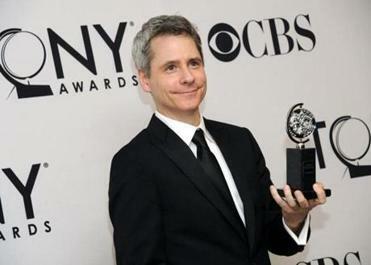 His “Clybourne Park,” a response to “A Raisin in the Sun,” won the Tony Award for best play in 2012. The play, she says, isn’t as simple as “movin’ on up” in 1970s sitcoms like “The Jeffersons” and “Good Times.’’ All of the plays written in response to “Raisin” underscore a painful truth: The Welcome Wagon did not roll up to greet the Younger family when they moved into Clybourne Park in 1959. The last scene is ripe with hope, yet riddled with despair. And the current debate around “Raisin” and the spinoff dramas raises yet another question. Does the play really end? Or is it about a future we’re still living and a future we’re headed toward?